These positions were started over previous weeks. You need a paid subscription for real time signals. Sector Funds, ETF and Stock positions are not included above. 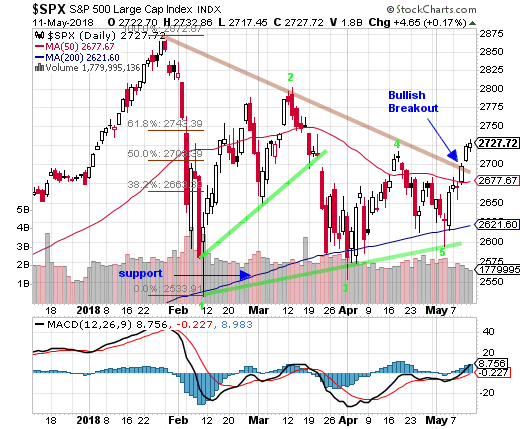 "After successfully testing its 200-day moving average line on Thursday, the S&P 500 Index (SPX) opened at that line on Friday and then posted a reversal rally that will likely trigger a buy signal in coming days. The reversal did trigger a buy in the Nasdaq 100 Index (NDX) portion of this strategy which will result in a 50% invested position for the strategy at the close on Monday." Last week we had a breakout for the Nasdaq 100 Index (NDX). This week the S&P 500 Index (SPX) also broke out as well as most of the major indexes. There are several very bullish indicators pointing to this rally being the one that finally puts the correction to rest. First, the below chart shows a pennant pattern. Breakouts or breakdowns from pennant patterns typically point to the direction the stock market will now take. On Wednesday the SPX closed above its long-term declining trend resistance line (top line of the pennant.) This was followed by an upside gap opening the following day. Second, pennant patterns tend to have a five wave pattern. Last week's lows were the wave five of a clearly marked Elliott Wave pattern. Wave five was followed by the breakout. Third, this was the third test of the 200-day moving average line as well as the rising trend support line (lower line of the pennant.) This correction has lasted much longer than typical. The market was due a reversal and rally that potentially will again reach the prior highs. The third test of major support, if successful, tends to be the final one. 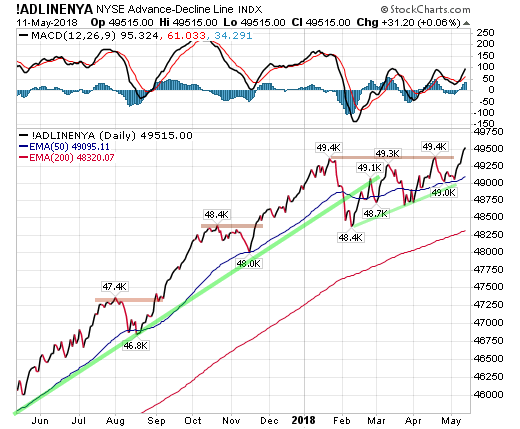 Another huge positive is the NYSE Advance-Decline Line which broke out to a new bull market high. This means it was not just a few powerful companies pulling the market up, but most of the companies in the NYSE which has 1600 stocks. Lastly small caps almost closed at a new bull market high. Small caps have been strong for weeks now and this week they tested their 50-day line which held. Not the 200-day line like the other indexes, but the 50-day. The test of the 50-day also completed a five-wave pattern. These FREE reports are great, but getting our timing signals daily is what you need to beat the market!